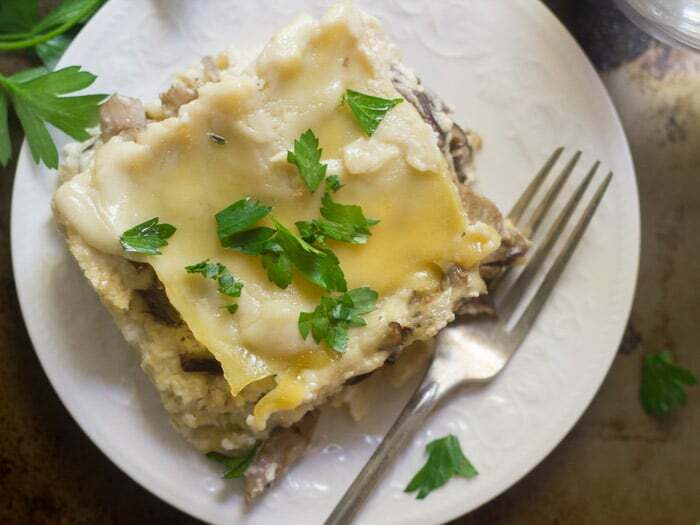 Sautéed mushrooms are layered between pasta sheets, creamy vegan ricotta, and gooey truffle-infused bechamel sauce to create this luscious, savory and super creamy vegan mushroom lasagna. Okay, so I’m thinking about holiday food already. You got me! In my defense, time is actually running short. I looked at a calendar the other day and Thanksgiving is way early this year. Just three weeks and some change. We better get moving! So I’m starting with a lasagna. Lots of other vegans and vegetarians I’ve known have told me they enjoy lasagna on Thanksgiving. In a way I think that’s a great idea. It’s a big, hearty main course that everyone can enjoy. It’s special enough for a holiday. Oh and it’s just about always delicious. But on the other hand, it kind of seems wrong to me. As someone who grew up eating Italian food, I’m just not down with Italian flavors on Thanksgiving. Savory, earthy flavors are what I’m looking for. 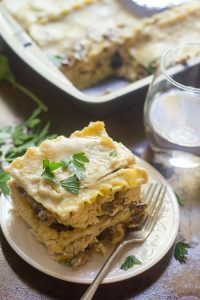 With that in mind, I decided to create a vegan lasagna that’s totally fit for Thanksgiving. I’ve used mushrooms in a vegan lasagna before, but never like this. This vegan mushroom lasagna is super savory. The mushrooms get sautéed and then simmered in white wine with some fresh thyme, then layered between sheets of pasta, homemade vegan ricotta, and gooey bechamel sauce. 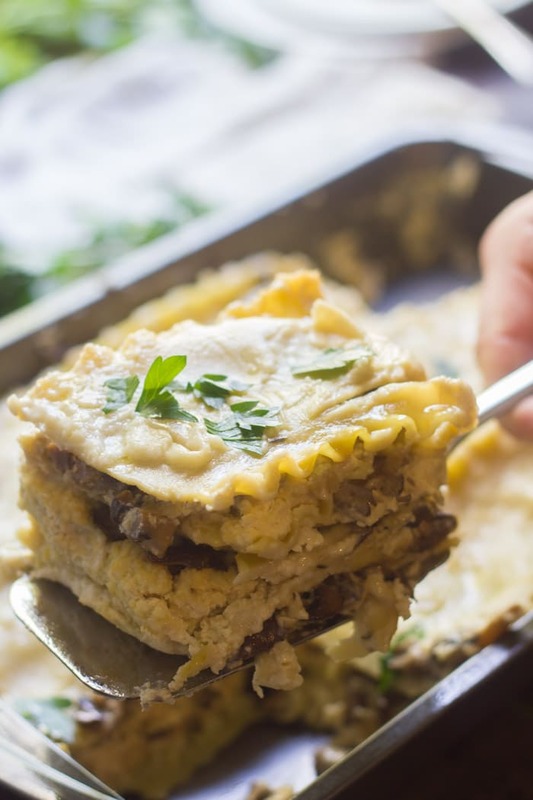 All the decadence, all the savory flavors I love in a holiday main dish, in vegan lasagna form. My creamy vegan mushroom lasagna came out super rich. You could seriously serve this to your omnivore family and I doubt they’d know it’s vegan. They probably won’t even think to ask where the turkey is. I’ve got a bunch more holiday recipes lined up over the next couple of months, and I know I’ve got plenty of mushroom haters reading. Don’t worry if you’re one of them: I promise to send some mushroom-free vegan holiday deliciousness your way very soon. Keep an eye out! Bring a large pot of salted water to a boil and add the noodles. Cook them according to the package directions, then drain into a colander. Return the noodles to the pot and toss with a few dashes of olive oil to prevent sticking. 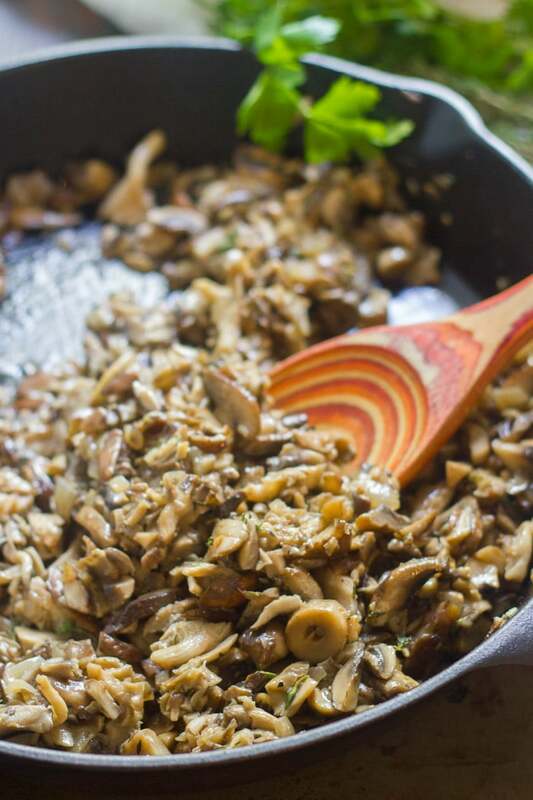 To make the mushroom filling, coat the bottom of a large skillet with olive oil and place it over medium heat. When the oil is hot, add the shallots and sauté until soft and translucent, about 5 minutes. Add the garlic and sauté about 1 minute more, until very fragrant. Add the mushrooms and cook for about 10 minutes, flipping once or twice, until they become tender and begin to release their juices. Add the wine and thyme to the skillet. Raise the heat and bring the mixture to a simmer. Lower heat and allow to cook until the wine has cooked off, about 10 minutes. Remove from heat and stir in salt and pepper. Taste test and add more salt if you like. To make the bechamel sauce, coat the bottom of a medium saucepan with the olive and truffle oil and place over medium heat. Whisk in the flour and bring the mixture to a simmer. Allow to cook, whisking constantly, for about 3 minutes. Whisk in the milk and bring the mixture back up to a simmer. Lower heat and allow to simmer, whisking frequently, for about 10 minutes, until the mixture is thick and creamy. To make the vegan ricotta, place the cashews, milk, lemon juice and garlic into the bowl of a food processor and blend until smooth. Add the tofu and pulse until the mixture takes on the texture of ricotta cheese. Mix in the salt, taste test and add more salt if you like. Preheat the oven to 350° and lightly oil a 9 x 13 inch baking pan. Ladle about 1 cup of bechamel sauce into the bottom of the prepared baking pan. Layer 3-4 noodles over the sauce layer, then spread half of the ricotta over the noodles and half of the mushrooms over the ricotta. Ladle about 1/2 cup of bechamel sauce over the mushrooms. Repeat with another layer of noodles, then ricotta, mushrooms, and bechamel. Top everything with a final layer of noodles, then ladle any remaining bechamel over the noodles and spread it out into an even layer. Cover and bake for 30 minutes. Uncover and bake 10 minutes more, until hot and bubbly around the edges. Remove the lasagna from the oven and allow it to sit for 10 minutes before cutting. Serve. I am totally making this one…..it looks delish! Do you think no-boil noodles would be okay to use in this dish? Usually I’m all for using no-boil noodles, but with this recipe I’m not sure becuase the sauce isn’t as liquidy as a traditional lasagna with tomato sauce. If you give it a try please let me know how it goes! I was looking up this recipe again to make this weekend and I wanted to let you know that when I made it for Thanksgiving I used the no-boil noodles and they worked perfectly. The lasagna was a hit with my meat-eating family, btw! I made this recipe with no boil noodles and found I needed to make 5 cups of bechamel. Delicious! Glad to hear the no-boil noodles worked! And glad you enjoyed it! Thanks Amanda! Did you use white or black truffle oil? Thanks! How did I miss this in November?? No matter, I know it will be wonderful in January or February when I make it; thank you! Yes! I think my husband’s comment was that this was a “really wintry dish.” Enjoy! How many servings does this make to go with the nutrition ingo? I work late tomorrow night, so I’m thinking about putting it together in the morning, refrigerating it, and then baking it that night when I’m home from work. Any reasons you can think of why that might not work? Alternatively, I could bake it tonight and then just warm some up tomorrow night. Does it hold up well in the fridge? Is it good re-heated, or better to eat it right after baking? I understand you may not have tried re-heating it and wouldn’t know how it does, but just thought I’d ask. I’m totally a left-overs person so I’m hoping this is a good recipe for that. Thanks!!! Would I be able to make the ricotta without tofu? I can’t eat soy. I actually thought about doing that myself! I think it would be great and I’d love to hear how it turns out if you try. I’m so glad you enjoyed it!! I actually debated adding spinach to this one – I’ll give it a try next time. Thanks so much Markus!! I love this recipe! I am not a vegan or vegetarian and used this recipe as the foundation for my lasagna (I did not have the ingredients to go vegan.) I did add a spinach layer before adding the Bechamel sauce (frozen chopped spinach thawed and excess water squeezed out). And I used cottage cheese mixed with EVO and garlic instead of vegan ricotta. 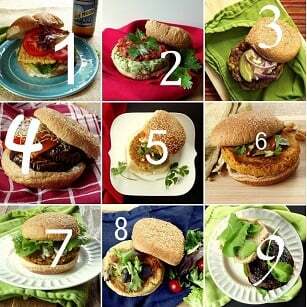 I am going to make this recipe all vegan next time! Yay! Glad you enjoyed it! I’ll have to try it with spinach!